Waxing Phases favor actions involving planting anew and moving forward, as energy increases throughout one half of your Zodiac Pie from 02 degrees Cancer through Leo, Virgo, Libra, Scorpio and Sagittarius until the next Full Moon at 17 degrees Capricorn 09 July 2017. This first New Moon of Summer is packed with plenty of changes as it arrives, asking for our awareness to remain alert to what ideas come along with it when we allow our imagination to work fully. 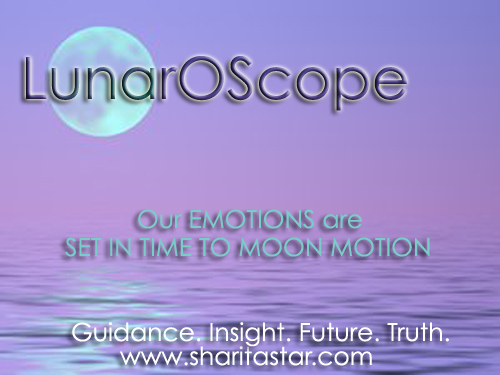 This lunation specifically asks us to shift any of our worries to concerns in order to attain emotional stability. New beginnings open within your home and family life, and listen carefully to any kind of déjà vu. Your environments are hypersensitive and should psychic phenomena surround you, you are absolutely meant to pay close attention to it, as the channels here are alive and well with intuition. Your state of mind is wide open to being nurtured, as well as your avenues of generating fresh ideas. This new information is ready so be sure to immediately get them down on paper to take action with. See what is also changing surrounding your neighbors or siblings and be willing to take a short trip. The practice of giving gratitude for what you already have opens new doors to rely upon as increases to your earning power are now seen, especially if more security is granted to you is involved with them. There may be new possessions you’ll find are equally ready to be brought into your life. As the world now sees that your appearance is amidst rapid changes, so too are you finding all kinds of new ways to approach your life as you intently nurture it. Your emerging self is stronger than ever to be able to utilize your natural talent of tapping into your intuition to receive important information. Time in the silent listen unfolds rewards as new answers speak from your solitude and inner process. Note messages dreams contain for your waking life, as your subconscious is a true channel that is able to guide you to welcome refreshed healing that moves you forward from hurts of the past. Listening carefully to what speaks from intuitive channels concerning your future goals along with your hopes, wishes, new friends, organizations and groups asks for your focus. Accept unexpected invitations to mix and mingle, as it is the time to not be doubtful about what can become of them. As your career finds you receiving information allowing you to find recognition and reward, there are new beginnings unfolding that concern your public life. Your intuition is sharp about what you also need to change within your view upon authority and the entire structure of your life, so listen closely. Your philosophies ask for you to deepen into your intuition to implement powerful changes for your truth, as education and spiritual pursuits find you journeying afar. Your insight shines to truly inspire imaginative energies that ask you to step out of your comfort zone to work with them successfully. The most regenerative new moon of your year asks you to embrace an intense intuitive process in order to experience rebirth concerning your overall state of wealth and sexuality. As many changes now circulate in this area of your life, be open to refreshing your outlook on your entire scope of life. New agreements are favored within your business or personal partnerships, and the time is now to recognize what you are meant to be imagining anew with them. There are plenty of conversations to be had and information to receive that certainly brings in a nurturing energy to comfort you both. A true intuitive process now speaks to enhance your ability to serve others, your health, habits and routines to activate positive changes. Energy is also in play to change what you may do with your pets. In any case, listen closely now to how you can nurture yourself and others all the better. Your attention is now captured by all you are meant to imagine from your children or brain-children, while love affairs equally may flirt with you. There is new life to allow shifts to occur upon your stage of creativity, so be ready to take a necessary bow and be clever when utilizing the information you receive. This two-week cycle favors letting go, review and redo as reflecting energy is seen throughout one half of your Zodiac Pie until the next New Moon in Aquarius. Mercury, our planet of communications, thinking, movement, mindset & mentality takes his first reflective passage of 2015 in Aquarius. 20 January’s New Moon well advises to carefully monitor courses of action taken for long-term success under the normal waxing phase that typically favors all things anew. As the Approach begins 05 January, what will need required review, redo and reworking will begin to speak until the retrograde officially begins 21 January, pointing to the expected changes that will naturally unfold under the retrograde cycle. Your home and family life require your emotional patience, as plenty of transformations equally call from your career and public life. When you surrender to the responsibility you must take now in your relationships, only then, will your approaches to life feel reborn and originally reinvent themselves. TAURUS: It’s time to focus upon release where I Communicate. Toss out those old ways of thinking your no longer need, and you’ll find your beliefs educate you with intense rebirth you can rely upon. There is more ways you can also recognize it is time to align your abilities to serve your self and others better, surprising the ways you are able to spend time alone. What’s no longer necessary to hold on to via your values, earning power and possessions is ready to fly, and this unfolds a core regenerative sensation to power up your wealth. Placing focus upon your creative nature makes sure the doors open wide to surprise your social scenes so you can thrive. Your old ways to approach your life as well as the way the world looks at you are asking to wash away with the tide, which, allowing the influence of your relationships to work in your favor. There is work to be done in your home and family life, so that new life can begin to open within your career. True healing calls from your subconscious realms, so allow the past into your space, and grieve what you must, which brings more command over your service to physical self and others. As you align more positive thoughts to assure you are truly believing, know that absolutely yes, you can achieve. You already logically know certain friends, groups or old hopes and wishes no longer serve you- and when these are acknowledged, you will create more than you ever have before. You are also wise to not doubt the gratitude for the value of what you have, so your wealth can unexpectedly transform. Your career is up for some reconsideration, and equal rewards if you’ve done the previous legwork to deserve them, as rebirth in your home and family life calls from across the way to also nurture. You can no longer resist changes to your approaches to life, in order to reinvent your relationships. SCORPIO: It’s time to focus upon release where I Believe. You know it’s time to surrender those worn our ways that your philosophies no longer work, as a refreshed mindset seeks to transform you. Again, it is that time in solitude where your answers align the most, as ways to serve yourself and others have surprises equally awaiting for you to hear them. Change is your most valued quality to respect in life and now you can expect it from the depths of your core, bringing forth a powerful rebirth with the value of what you have. Honor the request to work harder where you socialize, and your creative journey continues to unveil originality to rely on. Whatever partnerships simply drain you with too much work, it’s time to let them go, unleashing a intense approach to your life that has you feeling reborn. Your career and public life still asks for your focus to balance it, which grants surprising ways for you to feel regenerated at home with family. Resistance is futile concerning your habits, health and routines, and if you spend time in solitude, the answers are yours in what needs to be let go of the most. You already know educating your beliefs to achieve more is what makes those inventive thoughts spark with new life that even surprises you. Finish up old projects from your creative stage so your social scenes can hope, dream, and wish all the more powerfully, allowing friends to help express your mission. If you look to your wealth and the possibilities of how others finances can assist you, you’ll have shocking value with what you have. Waning Phase: 14 degrees Cancer to 00 degrees Aquarius New Moon. Energy completes and releases within this half of your Zodiac Pie throughout 20 January 2014. 14 degree point lunation’s bring along with them the energy that favors movement that will challenge us, and plenty of information to logically point us to know permanent change is undeniably here. As we experience the 1st Full Moon of 2015, we are profoundly reminded of 2014’s Grand Cardinal Cross alignment from April, which called for us all to recognize a new foundation that is forming within our lives. As this Full Moon in Cancer speaks with tense tones to Uranus and our South Node in Aries, North Node in Libra, and Pluto in Capricorn, the request to no longer resist change and surrender to what must finally release is heard very loud and clear. For those who enjoy the charts of astrology, our “Photograph of Time” upon 04 January’s Full Moon in Cancer, as it relates to all our other celestial bodies. Read on where you can expect something to initiate from this area of your life. Remember with all New Moons as they start another Waxing Phase, this two-week time frame until our next Full Moon 12 July favors actions involving anything new. However, being it is Mercury Retrograde, please read the important information to follow regarding this normal rule of thumb to be a slight thwarted for this lunation. As we arrive at a Full Moon in the same sign within 6 months, what starts now will have grown, re-developed and manifested accordingly in direct result to our intentions and efforts behind it. This typically will apply to your natal charts’ advice for an even more intimate perspective. Do consult a professional astrologer to read the accurate analysis of your individual natal chart for the precise area of life where 05 degrees Cancer affects your personal zodiac pie, precisely pointing to where the them of “if it is new it is for you” is unfolding. What natal planets are placed near any 05 degree points? These areas of the life will equally receive a direct line of communication from our 05 degrees Cancer New Moon, and depending upon the harmony or tension it can bring, connect you to more clues as to how your new beginnings will call loud and clear. Aries: The home, where I Nurture asks for carefully devote your curiosities to the family life and nest egg in the next two weeks. Déjà vu experiences speak to you now. The battle may still be on within your partnerships, but it is listening to the changes within your approaches to life that hold the keys that will transform your career and public life for good. Your core says keep going. Taurus: New ideas and ways of how I Communicate seek your patience to sort it all out, and writing is of great assistance here. Siblings and neighbors may request attention. Time alone provides more motivation to change up those habits and routines to serve better, and you still feel your beliefs regenerating. Allow your partnerships to teach you about stability for a change. Gemini: Your possessions and sense of what I Have asks to change up the value of your entire sense of security. With your earning power also in the mix, it is urged to find something different to do. With drive returning to your creativity, align it with the unexpected continuing in your social scene, as all regenerates your core. Remain patient in as you keep learning to serve better. Cancer: It’s the annual time for your approaches to life and the mask you wear to the world to look very different, all of who I Am. With the many options to choose from, find the necessary balance between where you nurture and your career- these answers hide within your relationships. Rewards await you in your creative nature, but only if responsibility is your guide. Leo: Your subconscious now reveals new mysteries where I Process. Dreams have plenty to say within your inner world, offering clues for the waking one. As your energized thoughts are breaking you through to new beliefs, there is a whole new way you are meant to serve yourself and others. Continue to be stabilized through the learning your home and family life can provide. Virgo: Your friends and groups where I Socialize ask to accept that unexpected invitation you will receive, which reconnects you to the past. Focus the best intentions upon your hopes, wishes and dreams. Know the action moving in your earning power is finding a new path to wealth, but it is all about what you create that backs it up. Thoughts serve you when you keep them positive. Libra: The career and public life where I Structure seeks to promote your work, as well as changes to your view on authority. Know what emerges anew requires attention to detail. All awakens your approaches to life to inspiration, as your relationships find further breakthroughs- but you must nurture at home. The value here stabilizes what you have and how you earn. Scorpio: Philosophies and spiritual quests where I Believe now ask for a rebirth. Traveling, even telepathically, is eager for you to learn. Your solitude still calls for attention, granting more innovation to serve the world and yourself better- and all is awaiting for you to be patient enough with your thoughts to do so. The responsibility to taking on new ways of life still channels deep. Sagittarius: Investments and your wealth ask you to aim to focus where I Transform. The benefit’s of other people’s money comes easily, but still cross t’s and dot those i’s under Mercury’s reflection. The action is on in your social life, to hope and wish for more, so keep creating your genius, so your earning power transforms more. Time alone tells you exactly how. Capricorn: Partnerships in your life where I Relate are looking for new energy to flow through them. Be aware of any legal documents you may sign. Plenty is moving within your career, but do not be surprised what shows up to handle at home- it all is simply part of the continuous changes to your approaches to life. Seek out a patient friend when you need the assistance. Aquarius: New life seeks to reinvent your health, personal habits, and routines where I Serve. What can be done to serve others better? Take time with the pets. Remember your beliefs are bursting with energy to take those innovative thoughts to a higher place- but it takes your time in solitude to complete the puzzle. Look to your career, treat it responsibility, and you’ll find reward. Pisces: Your intuition is thrilled to unleash your vivid imagination where I Create. New initiations flow here, and children may require your immediate focus. Love affairs flourish, but proceed with caution under Mercury’s reflection. The recharge from your core fuels something inventive within what you value, so hope and dream bigger about it. Believe in stability, and you will achieve. Energy initiates and builds within this half of your Zodiac Pie throughout 12 July. Moon VOC: When the Moon makes its’ last major aspect to a planet before entering the next sign, it is a recognized time that strongly advises us to not be in forward motion nor make any important decisions for the future. Remember, these are extremely important to note all month long. Whatever transpires under any Moon VOC, even from the simple items we may purchase, is well known to have “nothing become of it.” As we welcome our first waxing moon of Summer, as our New Cancer Moon conjuncts Jupiter in Cancer at 26 degrees, we will be asked to hold off and remain in reflection and review until it enters Leo. Moon Void of Courses always favor inner work. This Waxing Moon is full of interesting energies surrounding it, none of which hold it to any kind of commitments. The Chaldeans did not attach karmic mysteries to unravel with our singular digits. However, there still are extreme karmic associations with this New Moon, as the 5 relates our principals of communication, movement and versatility to be adhered to from where Cancer brings awareness to our lives. Any time we see the singular numbers, we are always looking at what can be referred to as “old soul” energy, in where things from the past are more that likely to come round for reexamination. In the case of this lunation from 5 degrees Cancer, you can bet the nostalgia might come into the collective picture, but it still won’t look the way it originally did. This New Moon is a bit of a “loose cannon” as it truly doesn’t have any strong communications with our other celestial bodies. Our Sun and Moon make a weak trine to Saturn, a weak square to Mars and Uranus -who are in opposition at 16 degrees Libra and Aries once again- and another weak opposition to Pluto. True to the 5, it has no grounded connections and wishes to make change happen instead, and we can expect plenty of unexpected energy to be surrounding what we see unfold under this New Moon. Being it is Mercury Retrograde, we can all be guaranteed this. Whatever new might start to stream from the Cancer area of life, we are best to be patient until at least after 01 July to think about what to do next if it involves serious decisions for our future. Even under Mercury’s Shadow -which will remain until 15 July- this is another waxing period of 2014 that is better off not biting off more new than you can chew. Read on where you can expect something to release in this area of your life. Remember with all Full Moons as they start another Waning Phase, this two-week time frame until our next New Moon 30 January favors review and redo. As we arrive at a New Moon in the same sign within 6 months, what has concludes now will make the ultimate space for new seeds to be planted in this area of the life later. This typically will apply to your natal charts’ advice for an even more intimate perspective. Do consult a professional astrologer to read the accurate analysis of your individual natal chart for the precise area of life where 25 degrees Cancer affects your personal zodiac pie. What natal planets are placed near any 25 degree points? These areas of the life will equally receive a direct line of communication from our 25 degrees Cancer Full Moon, asking to connect more clues as to how your reflections and release will call loud and clear as yes, we journey further into 2014. Aries: Devote attention to the nest egg and family where I Nurture. Wherever within the home that you’ve been procrastinating about cleaning, your perfect opportunity is now to get to work! Don’t ignore the deja-vu. Connect what reflects to the ongoing action within your partnerships, to your different ways of approaching the world, and how your career is realigning at present. Taurus: Worn out ideas where I Communicate are ready to uproot the thought patterns, and find healthy channels for your imagination to regroup. Short trips, siblings and neighbors may call upon you now. Connect what reflects to the ongoing action where you serve habits and routines, to your solitary time, and what value you have been rediscovering about all that you believe. Gemini: Part with possessions in your life or even donate to charity as you focus upon what I Have. Bask in what you hold dear, releasing any insecurities no longer of value to you. Connect what reflects to the ongoing action charging up your creative nature, to your friends and groups, and what worth you have revisited about what wealth and transformation truly mean to you. Cancer: Pure reflection shines upon you Dear Crab with all that I Am. Old approaches and first impressions to life ebb away, as you prepare for the world to soon see you differently. Connect what reflects to the ongoing action charging up your home and family life, to your reinventing career, and what value you have been discovering about all of the partnerships within your life. Leo: The depths of your truest solitude where I Process now ask for your subconscious to purge. Pick up your dream journal, for you’ll notice the channel to advise your waking world is strong. Connect what reflects to the ongoing action charging up your thoughts and communications, to your beliefs, and what value your ability to serve others and your health with is about to unveil. Virgo: Friends and groups where I Socialize captivate your attention. What doesn’t serve you, you’ll nit-pick about until you let them go. Any hopes or wishes unfulfilled here, the time presents itself now to revamp them. Connect what reflects to the ongoing action charging up your earning power, to your wealth, and what value your creative nature can bring to make solidarity reign. Libra: Your career and public life where I Structure, is ready for changes and conclusions to come forward. Revisit how you care about what you do- if the work is seemingly leaving you, it wasn’t meant to stay. Connect what reflects to the ongoing action asking to also revive your approaches, to your partnerships, and what value your home and family life nurtures you with. Scorpio: Worn out philosophies wash away where I Believe. Educational pursuits, memories of a recent trip or spiritual quest teach how you’ve recently grown within your life. Your higher learning wants your full attention. Connect what reflects to the ongoing action from your inner process, to your ability to serve, and what value your thoughts and communications stream in. Sagittarius: Your aims should focus upon reflection where I Transform within your wealth, other people’s money, and how you ultimately seek sexuality. Gain scope of everything surrounding you from depths of your core. Connect what reflects to the ongoing action where you socialize, to your creative nature, and what value your earning power is meant to receive. Capricorn: Excellence, like all you do in life, is what you equally expect where I Relate. What no longer works within any partnership has weighed you down emotionally- arrive at conclusions here. Connect what reflects to the action in your career, to your home and family life, and what ways you are meant to allow the world to see you differently- as your approaches also shift. Aquarius: There’s always a way you are looking to bring new life to things- best now to take this to your health and that friendly way you enjoy helping others where I Serve. You are eager to improve old habits and routines. Connect what reflects to the ongoing action where your beliefs live, to your friends and groups, and what power your inner process can lend to it all. Pisces: Where I Create asks for you to revisit the ways you nurture your lovely sensitivity from this area of the life. An on-going creative adventure completes. Whether physical children or brainchildren, spend some cozy time with them. Connect what reflects to the ongoing action where you regenerate, to your nighttime dreams, and what your hopes and wishes really want. Energy completes and releases within this half of your Zodiac Pie throughout 30 January 2014. Moon VOC: When the Moon makes its’ last major aspect to a planet before entering the next sign, it is a recognized time that strongly advises us to not be in forward motion nor make any important decisions for the future. As we welcome our first waning moon of winter and for 2014, as our Full Cancer Moon opposes our Sun at 25 degrees Capricorn, we will be asked to hold off and remain in pure reflection and review until it enters Leo. Allowing Chaldean Numerology to assist us further in knowing more ways to guide our energy properly, we have a fourth calling at the 25th degree point indicating we are wise to engage in careful observation and discern for what we see. With the natural properties of Cancer bringing in the real deal emotional landscape, this lunation will find us toying between the realms of logic and feeling, and once again, require less talk and much more listening. While any Full Moon casts the energy off for a completely reflective feel, at this degree point – as it was upon October’s, November’s and December’s Full Moon- we have one more request to truly take time in solitude and work within our inner processes from where 25 degrees Cancer personally affects our lives. Like our New Moon in Capricorn two weeks ago, the leadership areas of our lives (Aries, Cancer, Libra and Capricorn) are extremely activated, calling as well over this passage for reflection upon the new directions we are asked to go in. This 25 degree Cancer Moon stands alone, so within our SILENT LISTEN, what we can examine from The Crab will lead us to the answers, guiding us to innately know what we must release here. We’ve let it all go from the last Full Moon in Capricorn upon the 23 June to now move forward in our emotions that wish to sensationally leap within the delicate energies of The Crab. While any given New Moon typically brings a fresh start to our feelings, bear in mind we are within the second request from our Messenger Mercury, who is not looking where he is going right now while retrograding in Cancer. Be cautious of signing important legal documents or engaging in initiations associated with any new beginning under this Waxing Phase. However, this lunation will still request the seed planting where Cancer domesticates and sympathizes within your Zodiac Pie, but we will still wait in pause to activate them. The virtues of imagination, parenthood, and sensitivity are natural gifts of a Moon in Cancer. Instincts are well developed and active- as strong influences from our environments shape our feelings during this passage. The collective gravitates to a nurturing quality -urged to take care of whatever home and family needs are about- as time in nourishment of the soul is equally favored. Romantic idealizations, reliving experiences and cherishing moments can all cozy up together as our Lunar Lady feels absolutely protected when visiting with the familiarity of The Crab. As souls we can take this opportunity to bring forth what needs to now initiate in our lives –cautiously however under Mercury’s review- with emotion and spirit marking our moves. Take the next 2 weeks to plant those seeds that will, with proper intention, reap a fantastic harvest in the life further down the road. Visualize a gathering force as the Moon will travel from 16 degrees Cancer to where 0 degrees Aquarius’s energy falls within the birth chart. Even as Mercury is offering up review in Cancer, this half of your Zodiac Pie is ready for a fresh emotional feel to come into careful play throughout 22 July. Moon VOC is the passage in where the Moon makes its’ last major aspect to a planet before entering the next sign. In essence, it is a time that is well advised to not take up in forward motion nor important decisions for the future. As we welcome our first waning moon of summer, when our New Cancer Moon conjuncts Mercury Rx at 18 degrees Cancer, another request to remain in reflection and review is still favored until it enters Leo. While the new ideally wants to pour out from the Cancer area of our lives, we are still quite in the midst of Mercury’s offering for intense reflection here. As Mars enters Cancer 13 July, more drive and motivation will speak strongly, but make sure after 20 July -when Messenger Mercury will begin to move forward once more- is when the free-will chooses more wisely to proceed in forward motion from this area of the life, having the chance to truly fully breath. This New Moon at 16 degrees, has a close conjunction to Mercury Retrograde itself, who will be over at 18 degrees of Cancer. These two compound numbers speak deeply about understanding the spiritual blessings within our lives, and recognize what must be reviewed within our view of the material. As the weight was forecasted of what the current calling of Mercury’s reflection would bring, this New Moon ask for anyone to move in the eye of any apparent storm that may be surrounding them. Only there, in that tricky navigation, will the ever patient SILENT LISTEN be able to be heard. A strong trine speaks as well from Chiron Retrograding at 13 degrees Pisces, who will innately relate the old wounds that speak within The Fishes that connect to the Cancer area of the life- and these will ask we look at the glass as half full so the proper healing of them can intuitively come through. For the true astrology buffs, be sure to check the Cancer House, in particular where the 16 degrees Cancer spot in your natal birth chart lives. (A natal birth chart is determined from the time of birth, which allows a more in-depth look to equally see where some pondering is ideally meant to unfold in how the planets uniquely affect you.) Whether the collective or individual vantage point, these are the areas of life that call for you to bring forth initiation and beginnings within the next two weeks to follow. Properly embracing the new and gathering up in these areas until the next Full Moon upon 22 July will plant energies in place for future use. Aries: You’ve been in the review within the home, where I Nurture. Devote your curiosities to the family life and nest egg in the next two weeks, and watch doors begin to open wide. Those flashes of déjà vu experiences speak quite the psychic wisdom to you now. Time in your solitude makes the inner process work more strongly for you, so the messages come clearly what the new ways you are about to truly take care of your environments, will be ones that genuinely heal. Taurus: Reassessments of all kinds of ideas and ways of how I Communicate has been reeling. Siblings and neighbors may be requesting your attention. Slowly get those feelers out there if you haven’t sought to publish what is churning from your mind, for it’s time to teach everyone now what you know about patience. Look to how the old memories with friends, groups as well as how your hopes, dreams and wishes ask to reinvent the deepest thoughts you had of them. Gemini: Everything has been in reflection mode about possessions and your sense of what I Have. It’s been the time to change up the values of what you cherish, and your entire sense of security. Your earning power is also in the mix, which is urging to find something different to do anyway. Removing the unrealistic expectations within your career and public life, will allow you to break through and discover, there is something totally original and new just down the road. Cancer: As the spotlight of renew and redo has been shining already on you this month Dear Crab, it’s time for those approaches and the mask you wear to the world to look very different, within the sense of I Am. Those first impressions you carry are asking for new ways to take them in about life, and it’s going to be assisted by a learning process you embark upon if you let it. There are old beliefs that you’ve carried for years that now ask to be washed away with the tide. Leo: The re-examining of the deepest layers within your subconscious now reveal new mysteries to you where I Process. The truest sense of your soul is ready to reboot. Dreams have had a plenty to say, have you been writing these down? As change is ongoing within your inner world, you are off your natural stage for a pass. As you finally come to recognize the core transformation that is purging within you, it’s the last round of regeneration before you rebirth. Virgo: It’s been quite the reflective pass about your friends and groups where I Socialize. Accept that unexpected invitation you will receive, which more than likely reconnect you to the past. Hopes, wishes and dreams have asked you to reconsider them all -keep these in the best intentions- as the Universe is almost ready to aid you in manifesting your requests. Removing all those wounded ways you’ve understood your partnerships, makes room for the best yet to come. Libra: The career and public life has been asking you to reflect upon it all where I Structure. As you have been reviewing how to have more care and concern about what you do- you are gearing up to soon promote your work, equally noting a fresh attitude towards authority. This all has an interesting message to receive from how you serve to the world, as well as your routine and habits concerning your health. No longer will you be unbalanced here if you listen carefully. Scorpio: Philosophies and spiritual quests have been rereading the entire score where I Believe. You’re no stranger to surrendering to regeneration, and this now serves you in mysterious and mystical ways. Old educational pursuits come out as reminders. If foreign travel is not allowing a stamp on your passport, where you can travel to, even telepathically, is just as fun. Whatever your childhood taught you about your creativity, it’s time to shift into a space of healing within it. Sagittarius: Investments and your wealth have been asking you to aim to a more open place where I Transform, but watch Mercury’s request to not sign important documents. Word about other people’s money benefits comes towards you easily, but still cross t’s and dot those i’s. Reviewing sexuality is another channel that asks for your honesty. When you tie it all in to knowing the ways you no longer need to feel wounded about how you nurture, your healing will find it has arrived. Capricorn: It’s been a journey of reflection as of late in how your partnerships exist in your life where I Relate. Whatever communications misunderstandings our Messenger may be throwing your way, a new sense now asks to feel good about them. Know the regenerative process in your life has you in the right place. There’s a true calling to remove old thought processes that have only held you back up until now, so trust for once something new here will work for you. Aquarius: You have probably loved bringing new life to the reinventing of your health, personal habits, and routines where I Serve, which has been full on. Adapting within your environment of serving others asks you don’t remain resistant. Have the pets also been in your reassessment space? Someone in need at the shelter may await. There is healing to continue within your sense of value, which will then bring in a refreshed knowing of what you have and how to cherish it. Pisces: Your intuition must be in the midst of sensing it: the unleashing of that vivid imagination upon an old project that keeps you swimming in ultimately expressing yourself where I Create. New initiations about old things flow here, and children may also require your immediate focus. A love affair may have asked for rekindling. When you get the healing process completely understood from reinventing your first impressions to life, the world is so ready for the new you.